If the original PDF property is not enough, you can custom some new one for the PDF document with the help of VeryPDF PDF Editor which is a powerful application designed for editing PDF document specially. You can use it to edit the contents of PDF document such as text, draws, etc. You can also use the application to add comments, notes, stamps, links, etc to the input file. Now please see how to edit PDF custom property with this application! Double click the desktop icon of PDF Editor on your desktop. Click “Start”—“All Programs”—“VeryPDF PDF Editor v2.6”—“VeryPDF PDF Editor”. You can click “File”—“Open” to open “Open” dialog box and choose the file you want to edit PDF custom property, then click “OK” button. Click “Open” button in toolbar to open the same dialog box. Use the keyboard shortcuts “Ctrl”+ “O” to open “Open” dialog box. 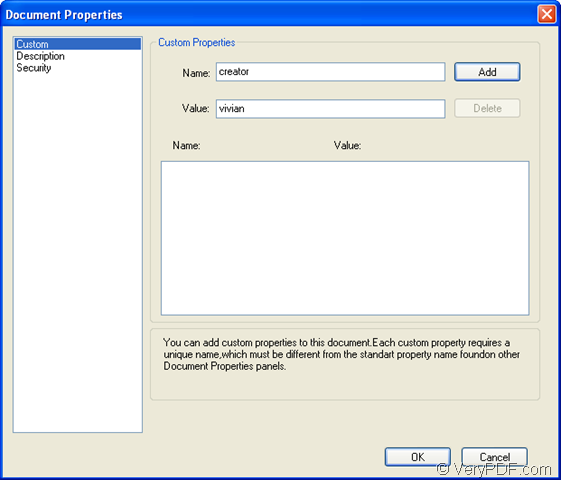 Click “File” in menu area and click “Document Properties” option in popup dropdown list. Press “Ctrl”+ “D” combination on the keyboard at the same time. 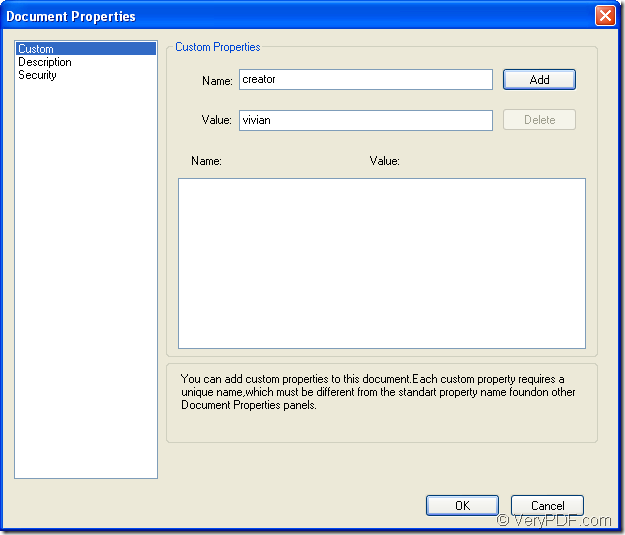 Please see the popup “Document Properties” dialog box in Figure 1. There are three options in Navigation Pane of the dialog box. Please click “Custom” and you will see the information shown in Figure 1. In “Name” edit box, you can type the name for new property such as “Creator”. In “Value” text box, you can input the property value such as “Vivian”. Then click “Add” button to create the new property. If you want to change the property, please click it in the box in the middle and its information will be back to “Name” and “Value” text boxes. The buttons “Add” will turn to “Change”. Just input the new one and click “Change” and the property will be changed to new one. If you want to delete this property, please click it and click “Delete” button. Then click “OK” button to close the current dialog box and you will see the user interface of PDF Editor again. Just click “Save” button in the toolbar or click “File”—“Save” to save the changes you have made to the PDF document. Please create a new PDF document via clicking “File”—“Save as” to open “Save as” dialog box in which you are able to location, name the target file. To use PDF Editor, you can download the free trial version at http://www.verypdf.com/pdf-editor/pdfeditor_setup.exe and install it on your computer. If it is necessary, please click a desktop icon for the application in installation process. The homepage of PDF Editor: http://www.verypdf.com/app/pdf-editor/index.html. How to read CHM file in flipbook style?